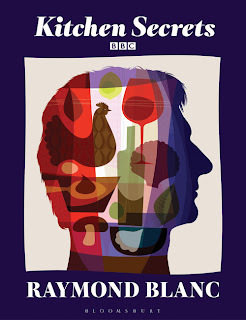 A while ago I was given Raymond Blanc’s cookbook Kitchen Secrets. I quite enjoy the fact that the cover reminds me of an 80s science school book – all primary colours and flat shapes – and inside there are some seriously stylish dishes that Raymond insists mere home cooks can recreate. Considerate man that he is, he gives each recipe a 1-3 star rating, with 3 stars meaning the most difficult (natch) – think ‘Tomato theme’ with a jelly, granite, sorbet and essence (eek!). I started off with the mouth-watering chocolate fondant (2 stars) with its salted caramel centre. The first time it turned out beautifully whereas the second time it was all a molten mass – delicious but just not right. Maybe I got too confident: baking is fickle! Anyway, the salted caramel mix which you freeze in ice trays ready for placing in the chocolate mixture makes far too much which is fantastic as they are delicious eaten straight from the freezer (not that I would do that, ahem!). Recently I had a lots of random odds and ends of vegetables – half a fennel, some carrots and courgettes - and my basil plant had not yet bit the dust (miraculous in a kitchen which struggles to get warmer than the -1 degrees outside! ), all perfect for the fresh sounding ‘Pistou soup’. I have to admit I doubted Raymond’s advice that the soup needed no stock as the vegetables give it flavour, but naturalmente he was correct. The soft earthy flavour of the veg was enhanced by the punchy pesto, salty parmesan and oily toasted croutons. It was very quick to make (it’s 1 star btw) and I’d perhaps add some small pasta such as orzo if you wanted something more substantial and Italian. As I am feeling ultra lazy of late (January does that to one, no?) here is the link to the recipe which he must have done on his TV show a while back. One of the things I love most about food and taste is how it can be so evocative of a memory or a foreign clime. While I have only just dipped my toe into the Middle east (if you count a short sojourn in glorious Cyprus), I absolutely adore the exotic flavour combinations: the heavy-handed use of herbs such as mint and parsley, the unusual combinations of meat with fruits and nuts, the unctuous dips made from chickpeas and aubergines all mopped up with soft flatbread – delicious. On BBC4 recently there was a riveting programme called Jerusalem on a Plate presented by the fab Yotam Ottolenghi, whose own eclectic style of cooking is influenced by his upbringing in Israel, combined with the flavours of the Mediterranean. The programme delves into the fascinating culture behind what is eaten in Jerusalem and just about every restaurant he visited was steeped in tradition, producing mouth-watering dishes I’d never heard of. Back in England, Middle Eastern cuisine is still far less familiar than Indian, Asian, Italian etc. and, with the exception of The Real Greek - which just misses the whole generosity of the meze experience in my opinion – there are no mainstream chains I can think of that have embraced the exciting street food of places like Lebanon, Turkey and Cyprus (perhaps thankfully!). I say this but with fashionable places like Ottolenghi, his new restaurant Nopi and the small, but perfectly formed Lebanese restaurant, Yalla Yalla in Soho, the cuisine is getting into the public conscience, and typical ingredients such as chickpeas and pomegranates are easily found in supermarkets. So, I dug out some recipes and put together a small meze spread of my own with tabbouleh, thyme-marinated chicken kebabs, roasted aubergine with a buttermilk sauce and homemade flatbreads. I thought the flavours might not all go together, but actually they did, albeit in a messy pile as you can from my picture. Like most people I don't worry about healthy eating at Christmas. Even the brussels sprouts don't escape being tossed in a pan with bacon (plus fat) and a fistful of butter, and every meal is an occasion. Come January, with the papers full of healthy eating plans and at least five new celebrity fitness videos on the shelf, it can be a shock to the system to suddenly revert back to cereal for breakfast, soup for lunch and simple suppers. So when I saw this Jamie Oliver recipe for fritters (or drop scones really) made out of cottage cheese I thought it was an elegant compromise between feast and fast. A take on the classic ricotta and honey often eaten for breakfast in Italy, these use only a little flour, are flavoured with citrus fruits and honey and barely need a wipe of oil as long as the pan you cook them in is very hot. Jamie uses cherries for the fruit, but December having drained my purse I used some frozen blueberries warmed in a pan. The nuts give a little exotic twist and crunch at the end. Toast 20g Blanched Almonds and 20g Pine Nuts (I used pistachios instead) in a dry pan until golden. Cool a little and then bash up in a pestle and mortar. Put 185, Cottage Cheese (or ricotta) into a mixing bowl, then add zest of ½ Lemon and ½ Orange, 2 large free-range Eggs, 1tsp Vanilla extract and 2 large tbsp Honey (or a little less of agave nectar). Whisk 125g self-raising Flour into the cheese mixture and leave to rest for 10 minutes. Put a large non-stick pan on a high heat and coat with a little oil and butter, wiping off any excess. Use a tablespoon to spoon the mixture into the pan. Turn the heat down slightly and let them fry until bubbles appear. Carefully turn over and cook for the same time on the other side. Put any berries (warmed or not) onto a plate and pile the fritters in the middle. Drizzle with more honey, sprinkle with the nut mixture and serve with a dollop of yogurt. This was supposed to be a 1st January post, but, just as quickly as 2011 slipped through my fingers, suddenly it is the 3rd January! While I’ll leave proper restaurant reviews to some far superior bloggers who detail every dish and even give scores, I thought I’d share my favourite places to go in and around London. They are all completely different which exactly mimics my utter failure to ever make a decision about anything - especially when faced with a menu. Far from being nonchalant and picking what I know I'll like, for some inexplicable reason I trick myself by choosing the unusual option, only to be consumed with food envy when my neighbours plate arrives! However, I had fantastic meals at these six restaurants, the majority of which I have been to more than once (which makes these reviews ever fairer, no?). Amazing food, amazing flavours, this restaurant produces Spanish food far away and above the usual seafood and chorizo. Tucked into a quiet spot on the Brompton Road, the interiors burst with citrus colours and the staff are so friendly that they feel like old friends when you leave, waving you off at the door. From memory, my sweetbreads with a poached quails eggs rolled in bread crumbs was divine and there was also a fois gras dish that I couldn't possibly explain but was absolutely delicious. Desert of sheep's milk ice cream, a creamy custard, salted caramel and candy floss was so unusual but pretty as a picture and again delicious. Some people may be put off by the Satis House-style feel of this 'cafe' set in what is surely England's more glamorous (and expensive) garden centre. I myself love it as the atmosphere is relaxed, bohemian and it feels rather like you are in the middle of a jungle. Besides, the food is delicious - very simple with an emphasis on seasonal ingredients (if you have the Chef Skye Gyngell's book, you'll know it is divided into seasons not course). The last time I was there I had the set menu which had only one main option of guinea fowl with chickpeas. Not liking either bird nor pulse very much I chose it anyway and, of course, it was fabulous. The bird had been roasted in spices and fell off the bone whereas the chickpeas, often so bland and hard in salads, were cooked to an almost creamy consistency. Puddings of tarte tatin and a chocolate cake were also devoured between four of us. At Polpo, the no-booking policy means you either have to scramble from work like a banshee to get there at six o'clock (all the tables are full by quarter past) or wait for a table in the stuffed but atmospheric bar area. Assuming I have a table or a seat at the bar, this Venetian-style restaurant always cheers me up with its enveloping atmosphere, quick service and unique plates of food. The food is mainly dark and rustic (much like Venice) and packed with flavour - dishes such as squid ink risotto, kale with anchovies and pork belly slow cooked with radicchio. I perfect finish is their affogato al café: a scoop of ice-cream drowned and melting in a shot of coffee. This restaurant is like a breath of fresh air among Chichester's chains and uninspiring restaurants. Set in the excellent, contemporary Pallant House Gallery, the small interior of the restaurant pack an equally glamorous punch with clean-lined furniture, striking flower arrangements and floor to ceiling windows overlooking its landscaped courtyard complete with pleached trees, silver sculptures and further seating for those occasional balmy summer days. The food is based on seasonal produce from their own green house and local ingredients (shellfish from Chichester Harbour etc.). I love how the dishes are bursting with colour and inventiveness which is just the right side of creative - take for example the 'chestnut flour and roasted onion gnocchi with smoked pancetta, rocket and parmesan' (£6.50). Also remember to order the restaurant's breads while you're waiting - absolutely delicious. n.b. Also recommended in West Sussex is the East Beach Café at Littlehampton which must be experienced on a sunny day. Perched on the pebbles in an odd shell-shaped modernist building, you are virtually on the sea. The menu is as fresh as the view and amazingly modern for a town that feels trapped in a time warp. There weren't many options when myself and two friends were faced with a meal out in Sherborne on a wet and grey Summer evening. We could either go for the (more expensive, busy and smart) The Green or The Three Wishes. Being fairly empty and with a title that I am sure was a book I read when I was five, the latter seemed an odd choice but we decided to go with it - and I’m glad we did. We all had the set menu which, at £22.50 for three courses and a glass of wine was amazing value. The meal itself was just the kind of tried-and-tested food you want to eat on such an uninspiring evening - a buttery tomato tart with rocket to start, a chargrilled steak with tarragon sauce, mushrooms and chips, and the creamiest lemon posset imaginable. This idyllic pub/restaurant/hotel sits in a glorious south downs valley and is one of my favourite place to have lunch after biking or walking. The theme is subtle but clear - with lobster pots perched on top of the bay windows, fish embroidered fabrics and a huge fish tank seperating the kitchen from the dining room through which you watch the chefs at work. But far from being too jolly-rodger-garish it is also stylish with huge leather sofas beside the fire, pots of olive trees and a large bar area made of teak wood. While not cheap the food is generous, with starters of overflowing pints of juicy prawns, salmon and tuna sashimi and seafood platters. Make sure you leave room for the delicious trio of puddings if on the menu. The Harlequin Café, Kilver Court, Shepton Mallet…for its quirky interior complete with Mulberry fabrics (it is owned by Mulberry founder Roger Saul) and delicious cakes/light lunches made with Sharpham Park spelt. Al Vicolo, 1/5 Swan Lane, Guildford…for the most delicious, simple Sicilian food and friendly staff all hidden up an unassuming staircase on a busy shopping alleyway. Numero Uno, 139 Northcote Road, London….for an authentic, old-fashioned Italian packed with character – it even had a dessert trolley, something I hadn’t seen for years, laden with the most incredible looking tiramisu’s, tarts and gateaux’s. Côte, Farnham, Guildford and beyond…for being a chain that still manages to produce consistently great and excellent value French bistro food. It is expanding at an incredible rate and I just hope it doesn’t get too big for its boots. Menoo Eclectic Food, 25 Kensington Church St…for a less expensive (and dare I say it, more friendly) Ottolenghi-esque meal and the most delicious risotto balls.